An extraordinary vacation in Africa: start with a romantic escape to the vibrant city of Cape Town, followed by the perfect luxury African safari at Singita Lebombo Private Game Reserve, ending on the pristine shores of Banyan Tree Resort and Spa in Seychelles for a decadent 5-star experience. This trendy vacation is a jet-setters dream come true. Your safari experience: Arrive in Cape Town, South Africa, one of the most beautiful cities in the world. Your stay at the trendy Cape Grace hotel, the crown jewel of bustling Victoria & Alfred Waterfront, is customized with private tours crafted to your personal taste and interest by Into Seychelles specialists. Fly to Singita Lebombo and experience a deluxe safari in one of Southern Africa’s most exclusive private game reserves and luxury lodges. Expertly-led Guided Safaris explore the game-filled wilderness to witness all of Africa's big game. End up on the beaches of beautiful Banyan Tree on this memorable vacation. On arrival in Africa, experience a personalized welcome and private transfer assistance by the Guided Safaris team. One of the world's most beautiful cities, Cape Town is a natural spectacle in an enchanting corner of South Africa. Experience trendy nightlife, beautiful sightseeing and world-class hotels and dining in the vibrant Cape. The elegant Cape Grace hotel is a luxurious retreat set in one of the world's most vibrant cities. Grandly sited on its very own private quay overlooking a private yacht harbor at the world-famous V&A Waterfront in Cape Town, the Cape Grace hotel is a star destination on its own offering the ultimate experience for the discerning jet-setter. The Cape Grace is charming and intimate in atmosphere: Experience the "it-factor" of the Cape and personalized hospitality. The young staff are generously on hand to arrange everything from restaurant reservations and tips on to where to catch the Jazz scene to purchasing tickets to Table Mountain or Robben Island. The sumptuous Cape Grace elegance begins with a welcoming reception extending to the rich comfort of the spacious harbor and mountain-facing rooms. A boutique hotel with just 121 rooms, the Cape Grace offers an immediate sense of place and comfort. Indulgence in massage therapy at the Cape Grace Spa relaxing to treatments with an extraordinary view of Table Mountain, or enjoy the African sun setting on an amazing panorama of Cape Town at the outdoor pool. The Signal restaurant and Bascule Bar are sleek dining options overlooking the bustling yacht marina - a perfect place to take in alfresco meal and local chatter, accompanied by a glass of superb Cape wine. 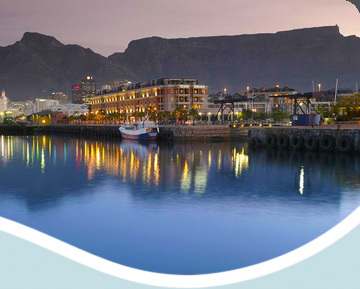 The Cape Grace is centrally located with quick and easy access to the airport, city center and popular attractions. Enjoy IntoSeychelles Signature Private Guided touring of Cape Town with your very own professional guide and car on a custom itinerary through the city, winelands and further afield through the Cape of Good Hope. Singita Lebombo concession is one of the most game prolific regions in South Africa. Located in a private game reserve in the North of Kruger, the concession is reserved for the exclusive use of Singita guests. Singita Lebombo Lodge features just 15 luxury suites dramatically perched on the mountain-side to offer panoramic views of the beautiful and gamerich riverine forest below. Knowledgeable and experienced rangers take you on extraodinary game drives through the pristine wilderness. Gourmet meals are served with the finest South African vintages from the Singita Bush Cellar. A Singita Spa, Gym and African Gallery are also offered.